For many government processes, there’s a need for a staff member to manage an application through multiple steps, and be the point person responsible for completing later Collect Information steps that are set for Team Members (someone internal to your organization) to fill in. You can use the Assign Someone step in a template to make sure that the right people add information in to an application at the right time, so the process moves forward. 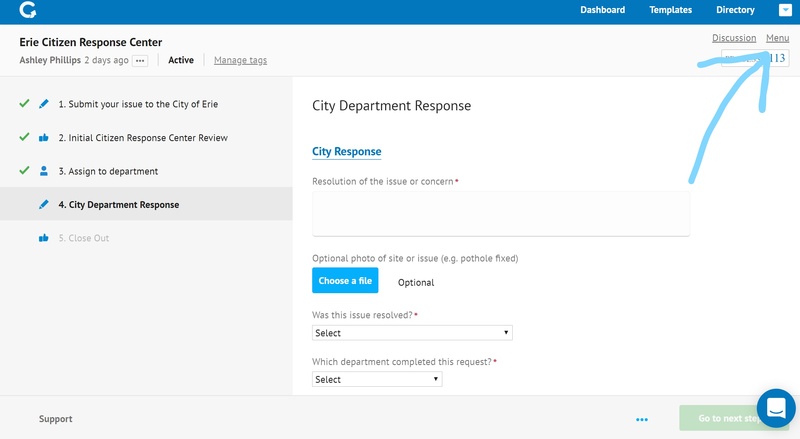 For example, the City of Erie hosts their Citizen Response Center workflow on CityGrows. 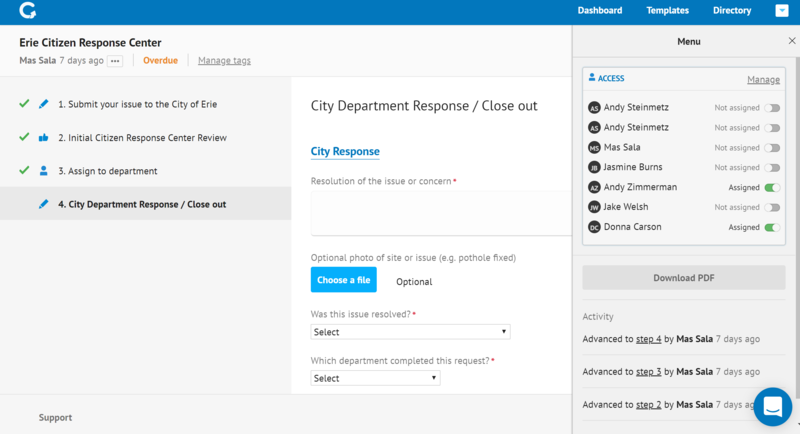 As each request/ complaint/ compliment comes in, a staff member reviews it and uses the Assign Someone feature to route the application to the correct department or individual for a response. The Assign Someone step type is perfect to use when you can't tell in advance who needs to be added in to the process from inside your organization. (When you know in advance who exactly will need to review a process, it may make sense to use a Review step instead). Whether or not there's an Assign Someone step in your process, you can see who is currently assigned, and make reassignments if need be. Just open up the Menu option in the upper right of the screen, with any individual application or process selected. Once it's open, you'll see a list of all the possible admins, and who is currently assigned. In an Assign Someone step, only one person can be assigned. More than one person can be assigned via the Menu section, and you can also toggle on/ off assigned staff via the Menu option as well. Let us know how you're using the Assign Someone step type!